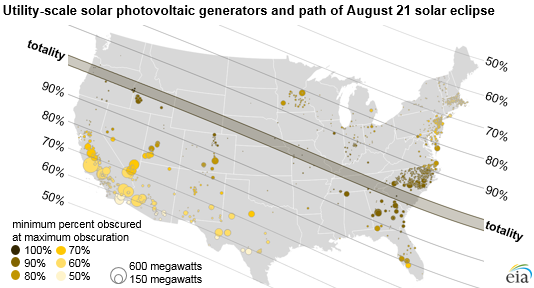 On August 21, a solar eclipse will obscure the sunlight needed to generate electricity at approximately 1,900 utility-scale solar photovoltaic (PV) power plants in the United States. However, relatively little solar PV capacity lies in the path of totality—where the sun will be completely obscured by the moon—and the North American Electric Reliability Corporation (NERC) does not anticipate the eclipse will create reliability issues for the bulk power system. 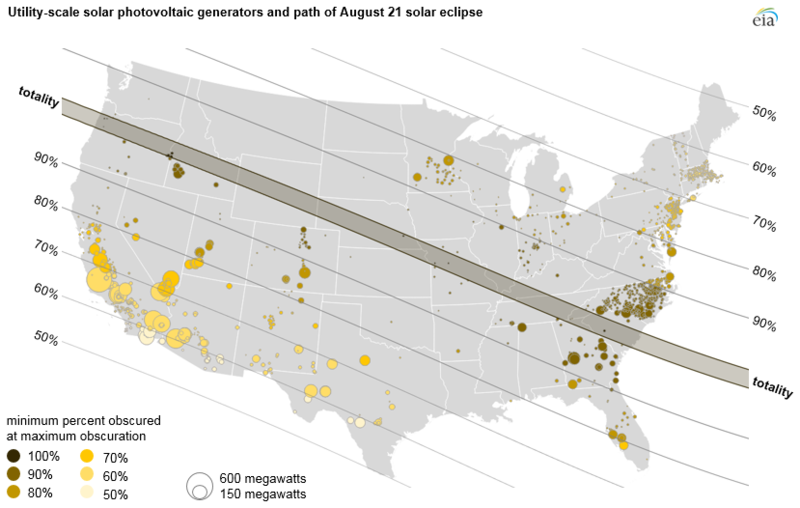 Solar-powered generators centered in the path of totality will be affected the most, as the moon will block all direct sunlight for up to three minutes. These generators will also be affected to a lesser extent throughout the entire eclipse event, which will last for up to three hours, measured from the onset to the ending of any blockage of direct sunlight. Generators outside of the path of totality will be less affected, depending on how much sunlight is obscured. The path of totality spans the United States, starting in Oregon and moving eastward to South Carolina over the course of approximately 90 minutes. The path of totality only affects 17 utility-scale solar PV generators, mostly in eastern Oregon. Hundreds of plants totaling about 4.0 gigawatts (GW) of capacity—mostly in North Carolina and Georgia—will be at least 90% obscured. Another 2.2 GW and 3.9 GW of capacity are in areas that will be at least 80% and at least 70% obscured, respectively. The values in this analysis reflect utility-scale generators of at least one megawatt of capacity and do not include small-scale solar PV systems or utility-scale solar thermal generators, which in 2016 provided 0.5% and 0.1% of total U.S. electricity generation, respectively, compared with utility-scale solar PV, which provided 0.8%. EIA’s capacity and generation data for small-scale solar PV systems is only available at the state level. During the eclipse, electricity generators in the areas affected by the eclipse will have to increase output from other sources of electricity generation to supplement the decrease in solar power. NERC’s recent 2017 Summer Reliability Assessment does not anticipate any impacts on the reliability of North America’s bulk power system attributable to the eclipse, based on an analysis published in April. Although California is not in the path of totality, the state’s 8.8 GW of utility-scale solar PV make up 40% of the country’s total capacity (as of May 2017). 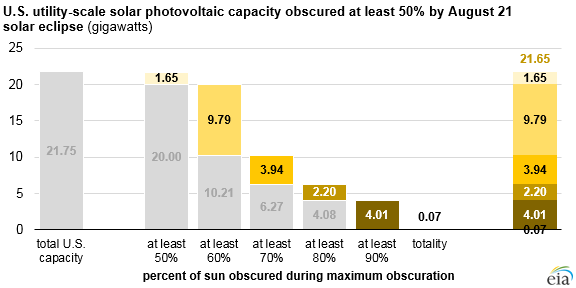 Based on the amount of sunlight obscured for each of the state’s generators, the California Independent System Operator (CAISO) estimates that California will experience a reduction in solar generating capacity of almost 4.2 GW during the eclipse, which is estimated to partially darken the state from 9:02 a.m. to 11:54 a.m. local time. To ensure electricity demand is met during those hours, CAISO plans to replace solar generation with electricity from natural gas and hydropower plants, the latter of which are generating at higher levels than previous years. North Carolina has the greatest amount of installed PV capacity in the band that will be at least 90% obscured. As of May, the state totaled 2.8 GW of utility-scale PV installations, or about 13% of the national total. Duke Energy, one of the largest utilities in North Carolina, estimates that solar energy output across their system will drop from about 2.5 GW to 0.2 GW at the height of the eclipse. However, solar power makes up a much smaller portion of North Carolina’s generation compared with California. In August 2016, utility-scale PV, utility-scale solar thermal, and distributed PV supplied 3.1% of North Carolina’s electricity generation, compared with 14% in California.